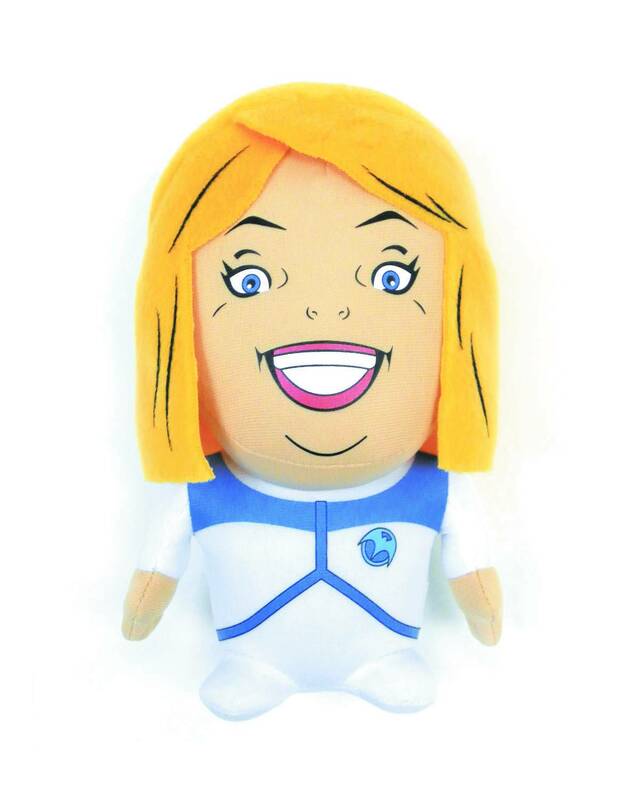 Valiant is poised to take the Big Apple by storm with an incredible line-up of con-exclusive collectibles and merchandise…available only at New York Comic Con 2017! From Thursday, October 5th to Sunday, October 8, join the most acclaimed publisher in comics today inside New York City’s Jacob Javits Convention Center at booth #1635 for a comprehensive selection of explosive exclusive, must-have giveaways, action-packed apparel, mesmerizing merchandise, and award-winning comics and graphic novels that adds up to Valiant’s biggest slate of NYCC offerings ever attempted! First: Visit Valiant for a complete selection of trade paperbacks and deluxe hardcovers from the largest independent superhero universe in comics today, with critically acclaimed and award-winning titles including BLOODSHOT REBORN, BRITANNIA, DIVINITY, FAITH, NINJAK, QUANTUM AND WOODY, X-O MANOWAR, and many more! 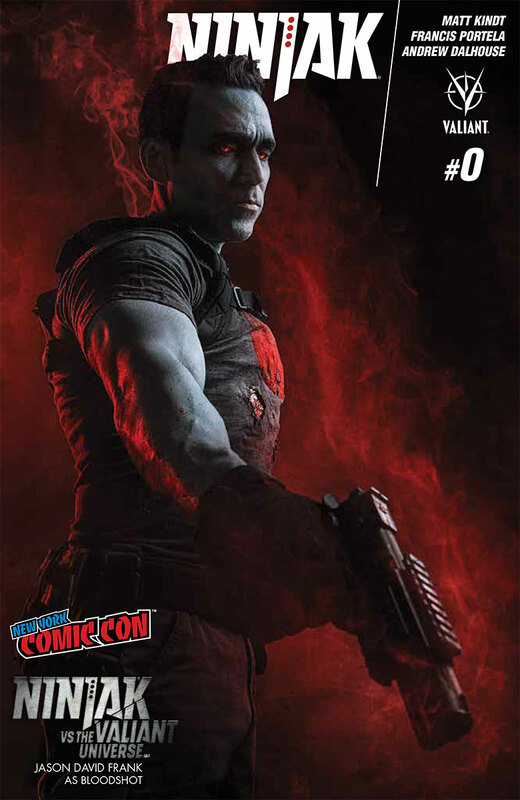 Then: Arrive early to scoop Valiant’s expansive array of NYCC-only exclusives, including the hotly anticipated BLOODSHOT BEAR, produced by Build-A-Bear, Fansets’ BLIND-BAGGED VALIANT ENAMEL COLLECTOR’S PINS – featuring 12 of Valiant’s fan-favorite heroes and villains, plus a Bloodshot NYCC-only edition – the BLOODSHOT SALVATION #1 NYCC 2017 EXCLUSIVE VARIANT, and much more! 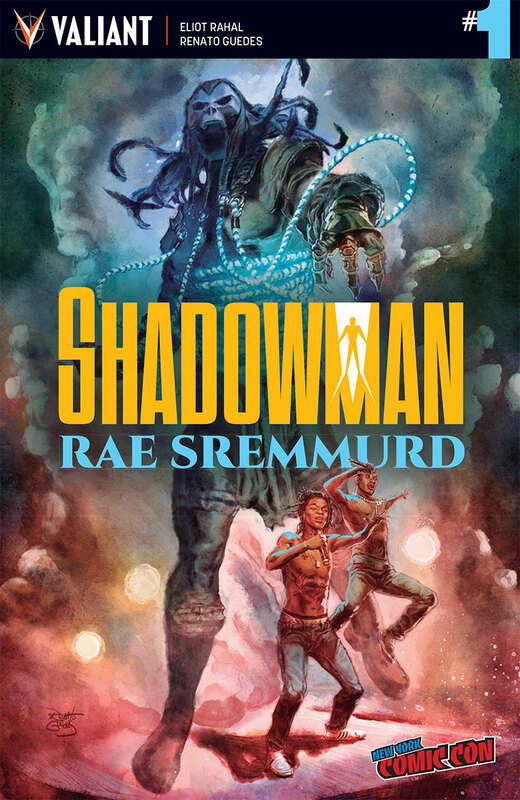 Plus: Don’t miss Valiant’s all-new selection of convention-only giveaways including the VALIANT ICONS SNEAK PREVIEW, SHADOWMAN/RAE SREMMURD #1 NYCC 2017 EXCLUSIVE VARIANT, and two new editions of NINJAK #0 featuring the stars of Valiant’s upcoming digital promotion, NINJAK VS. THE VALIANT UNIVERSE, that won’t be found anywhere else! 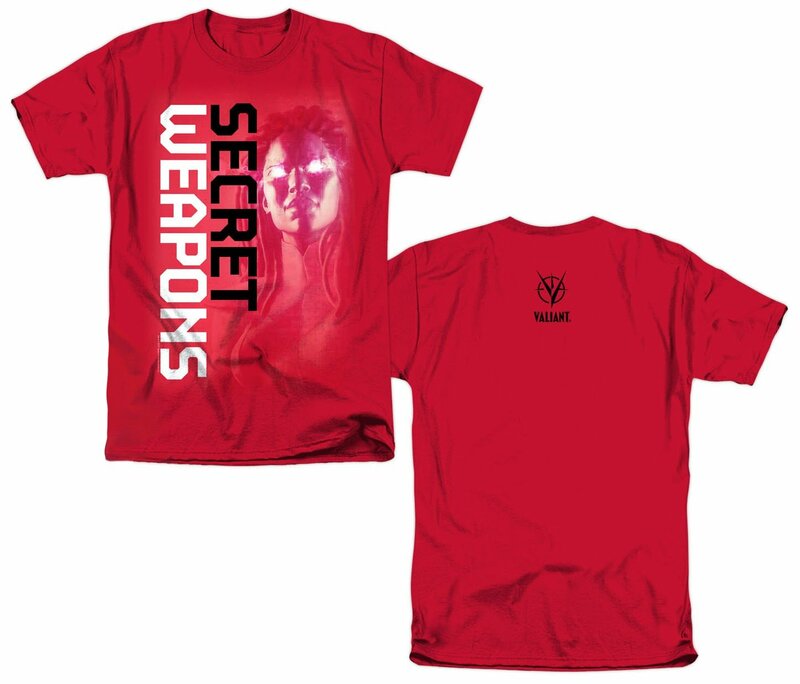 Check out Valiant’s complete selection of free giveaways, exclusives, apparel, and merchandise below…and be sure to visit Valiant at booth #1635 as soon as you arrive at NYCC 2017! Look forward at Valiant’s most anticipated new series debuts of the fall – BLOODSHOT SALVATION #1, NINJA-K #1, and QUANTUM AND WOODY! 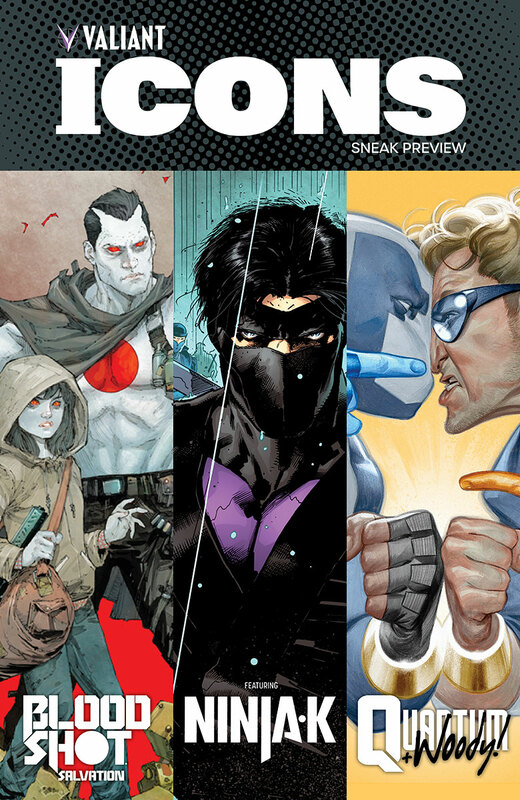 (2017) #1 – with this advance, convention-only sneak preview featuring lettered previews of each Valiant ICONS title! Available only during the Jason David Frank signing on Friday, October 6th at 6 pm ET. Limit one per attendee while supplies last. 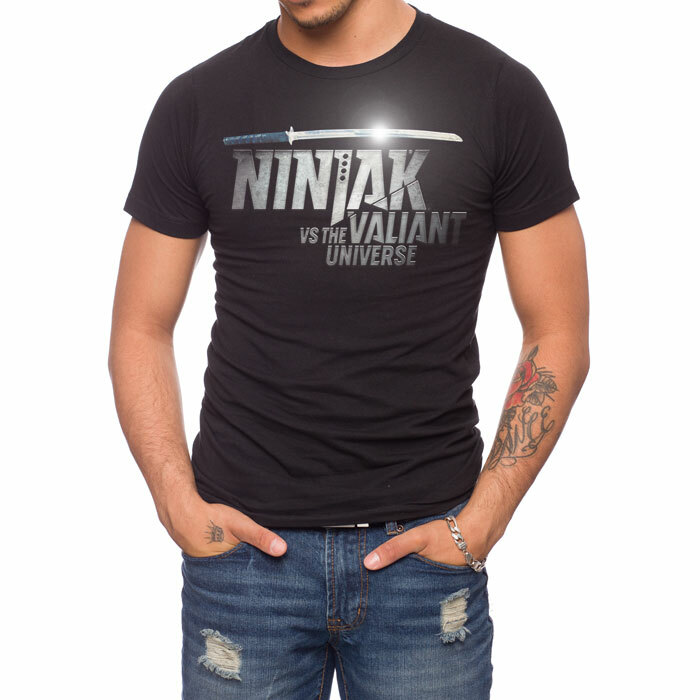 Available only during the NINJAK VS. THE VALIANT UNIVERSE cast signing on Saturday, October 7th at 12:15 pm ET at the Valiant booth (#1635)! Limit one per attendee while supplies last. Available only during the Rae Sremmurd signing. Look for date and time information to be announced shortly. Limit one per attendee while supplies last. STRICTLY LIMITED TO 250 PIECES! 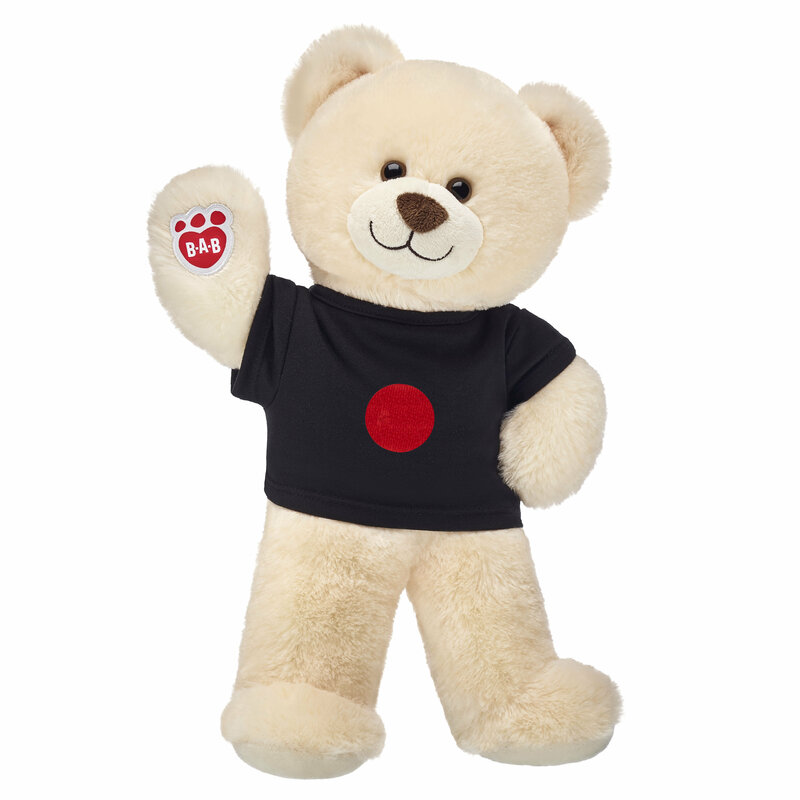 Strictly limited to 250 pieces, this cuddly, buttercream-colored companion comes complete with an official Bloodshot logo t-shirt, collectible carrying case, and an exclusive BLOODSHOT SALVATION #1 Bear Photo Variant. STRICTLY LIMITED TO 75 PIECES PER DESIGN! 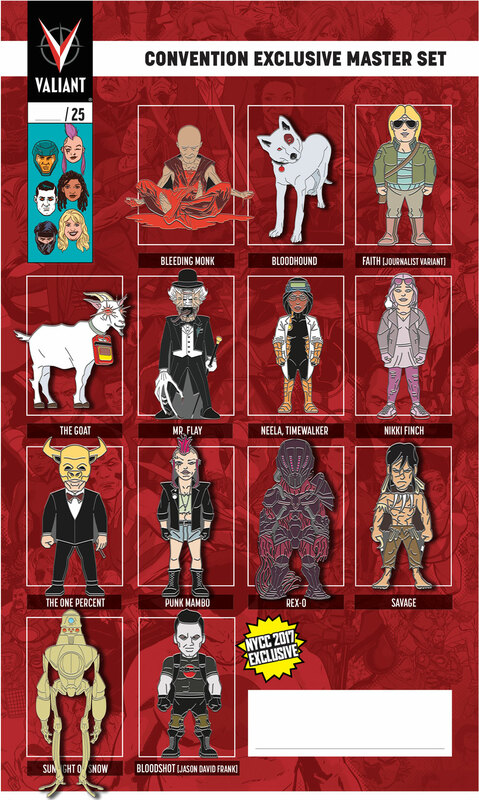 Get one of 12 highly limitedV aliant enamel pins in each collectable blind bag package! Featuring an all-star selection of characters jumping off the comics page for the very first time, including The Bleeding Monk, Bloodhound, Faith (Journalist Variant), SECRET WEAPONS’ Nikki Finch, The Goat, THE VALIANT's Mr. Flay, The One Percent, Punk Mambo, Rex-O, Savage, Neela Sethi, and Sunlight on Snow! 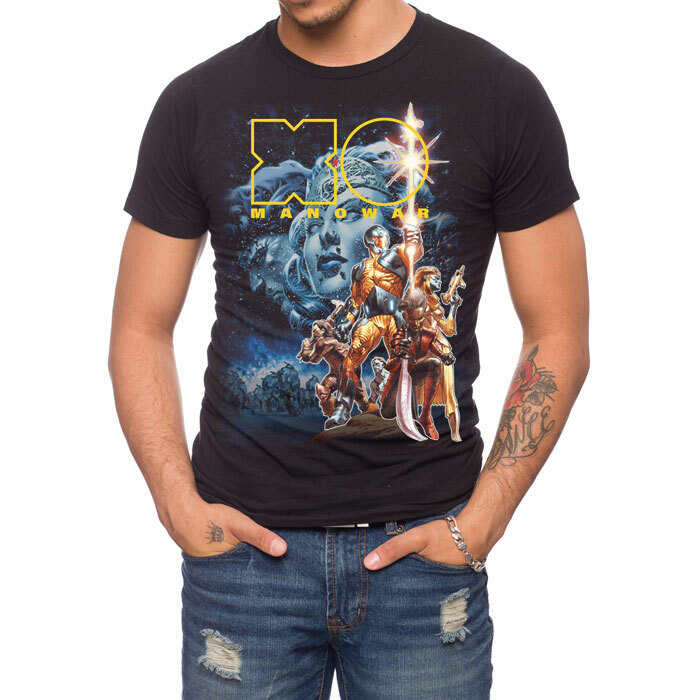 Limited to 75 pieces per design – and featuring randomly inserted, rare "gold variant" designs! 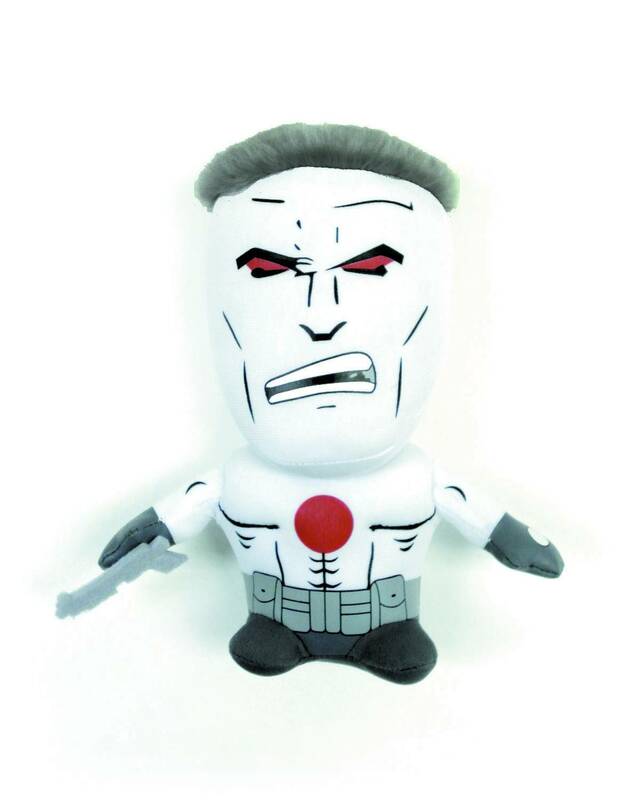 A limited edition Bloodshot collector’s enamel pin, immortalizing Bloodshot as portrayed by Jason David Frank in the upcoming live-action, digital promotion NINJAK VS. THE VALIANT UNIVERSE! STRICTLY LIMITED! ONLY 25 MASTER SETS PRODUCED! Limited to just 25 complete sets! Skip the blind bangs and grab all 13 of Valiant’s NYCC-exclusive designs in one go – packaged together on a limited-edition, exclusive backer card that can’t be found anywhere else! A NYCC-only limited edition of the FIRST ISSUE of blockbuster new series by New York Times best-selling writer Jeff Lemire and extraordinary artists Lewis LaRosa and Mico Suayan – featuring an exclusive cover by rising star Soo Lee! 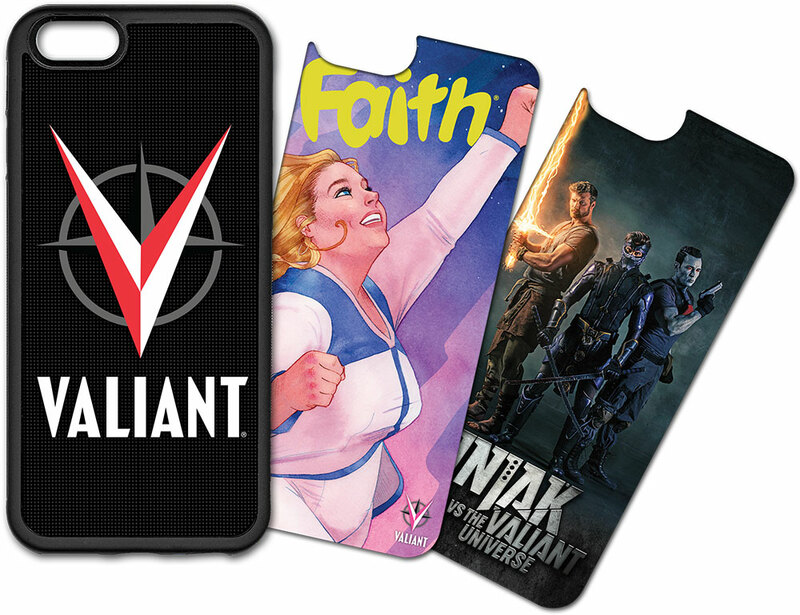 Your favorite mobile device joins the ranks of the Valiant Universe with these high-quality, protective rubberized phone cases – each of which comes complete three swappable, interchangeable background designs featuring FAITH, NINJAK VS. 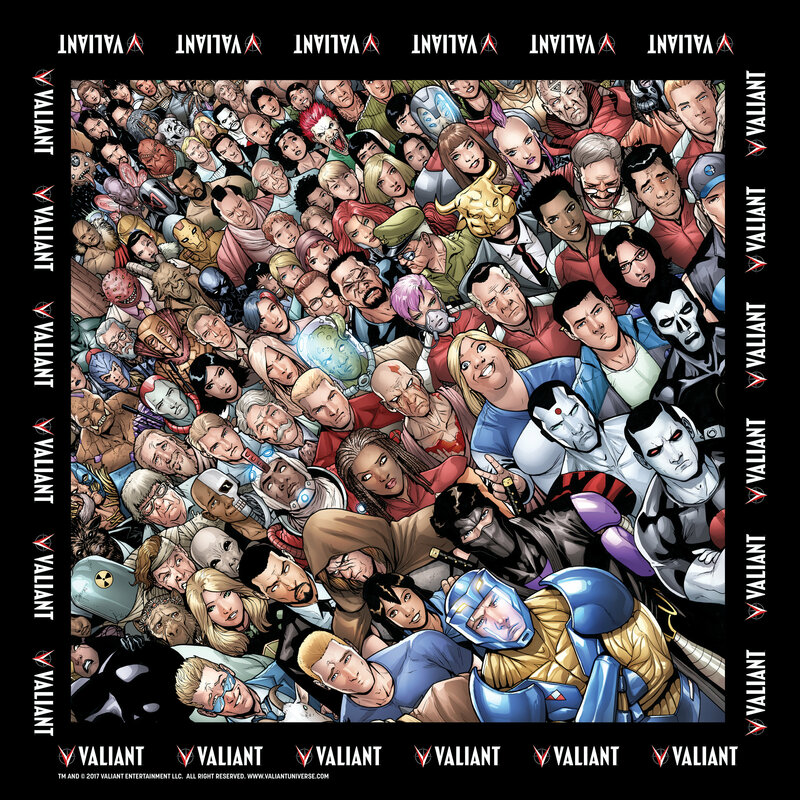 THE VALIANT UNIVERSE and the iconic Valiant logo! Available for iPhone 5/5S/SE/6/6S/6 Plus/7/7 Plus and Galaxy S7/S8 while supplies last. 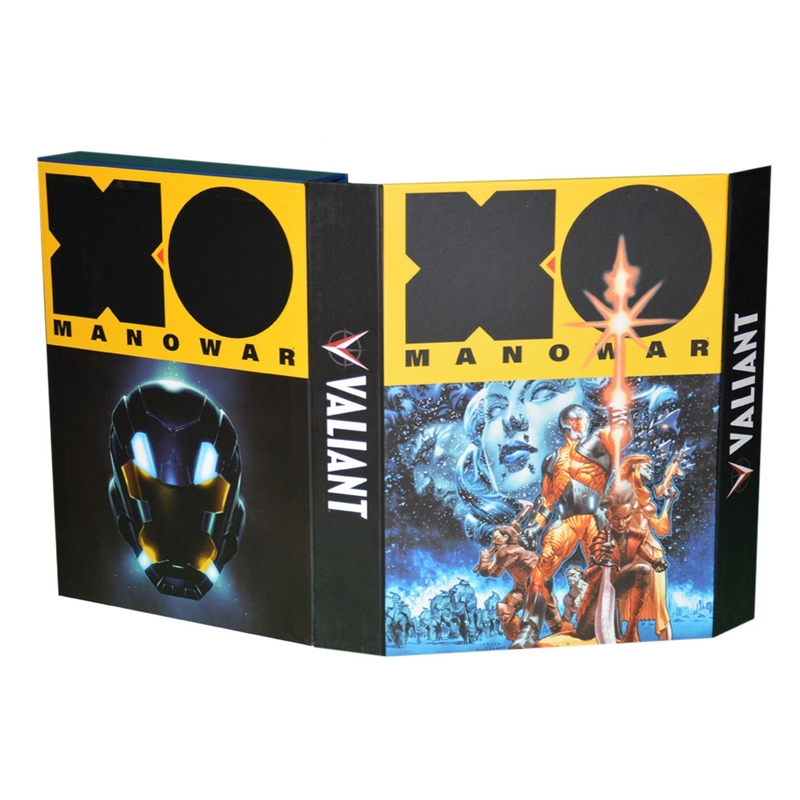 Transport and store your most beloved Valiant comics in this rigid, drop-back portfolio box, featuring blockbuster X-O Manowar artwork by artists Lewis LaRosa and Monika Palosz! 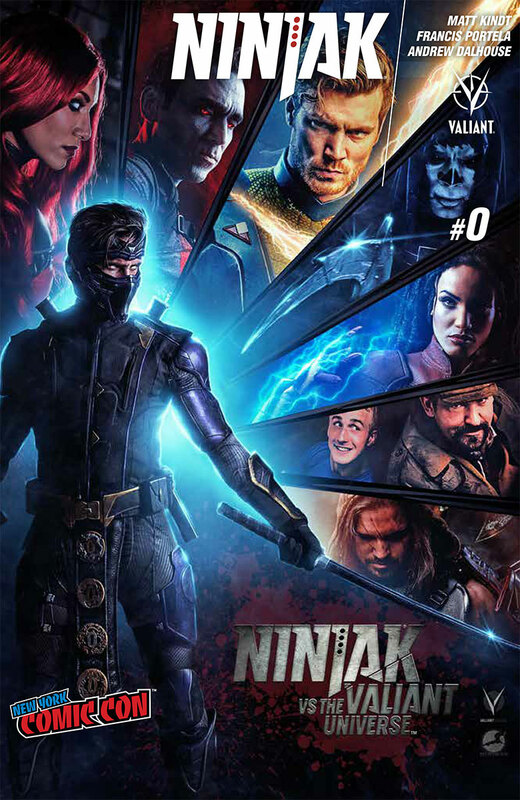 The Valiant Universe’s award-winning roster of characters surround BCW’s trusted comic book short storages boxes with an awe-inspiring wraparound design illustrated by blockbuster artist Diego Bernard (X-O MANOWAR, NINJAK) – complete with an eye-catching print of Valiant’s iconic logo on the top storage lid! 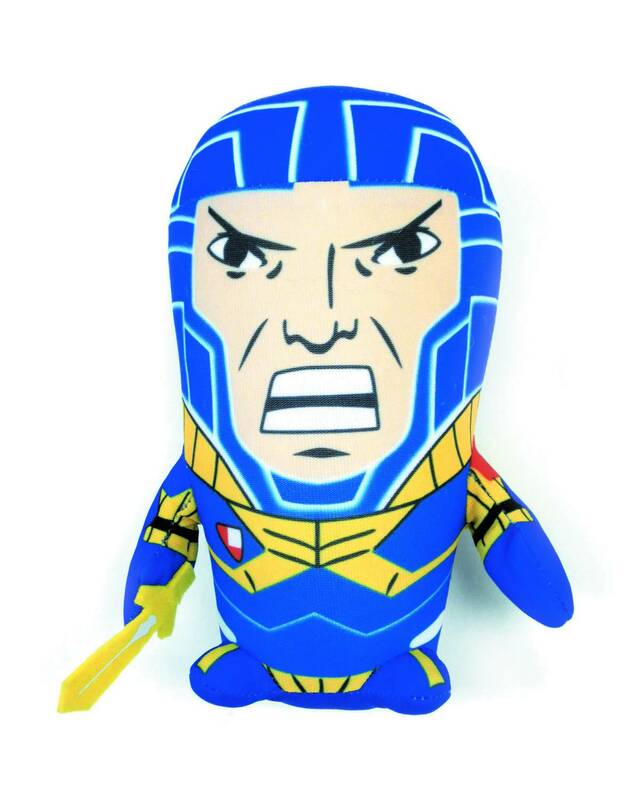 Valiant’s ever-popular, super-deformed plush dolls are back – and just as collectible as ever! 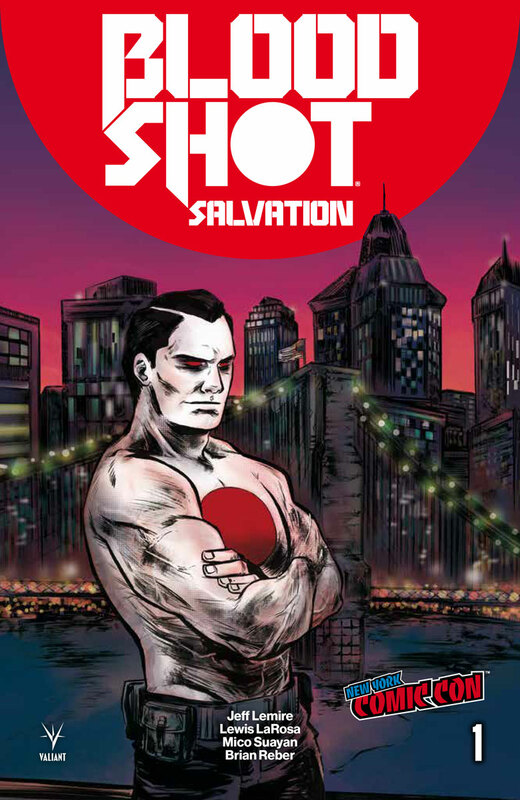 Choose from Bloodshot, Faith, and X-O Manowar – or grab all three! 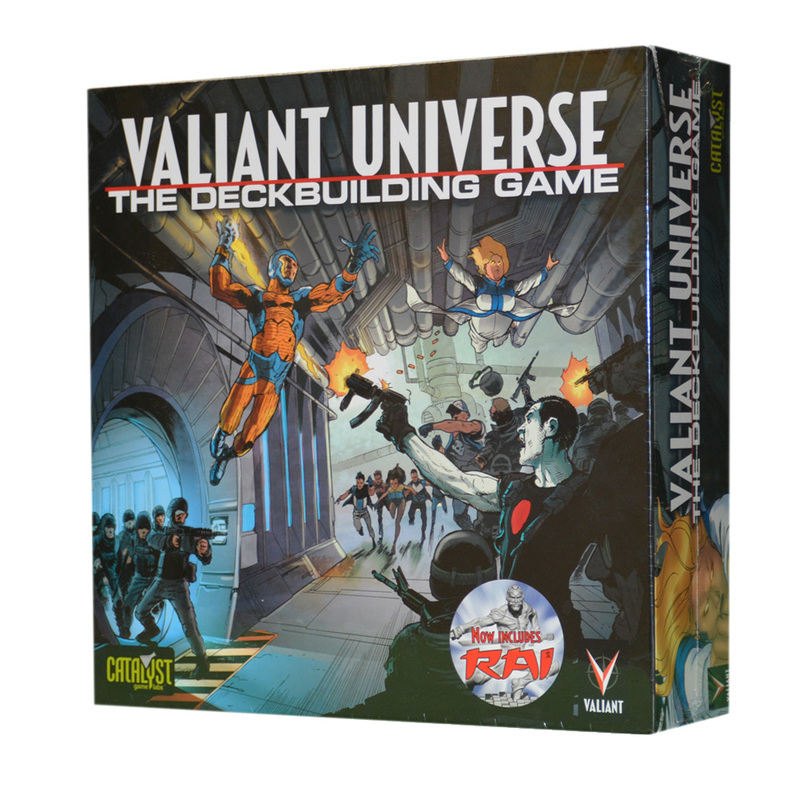 The heroes of the Valiant Universe are yours to command in this acclaimed and adrenaline fueled deck building game by Catalyst Game Labs! 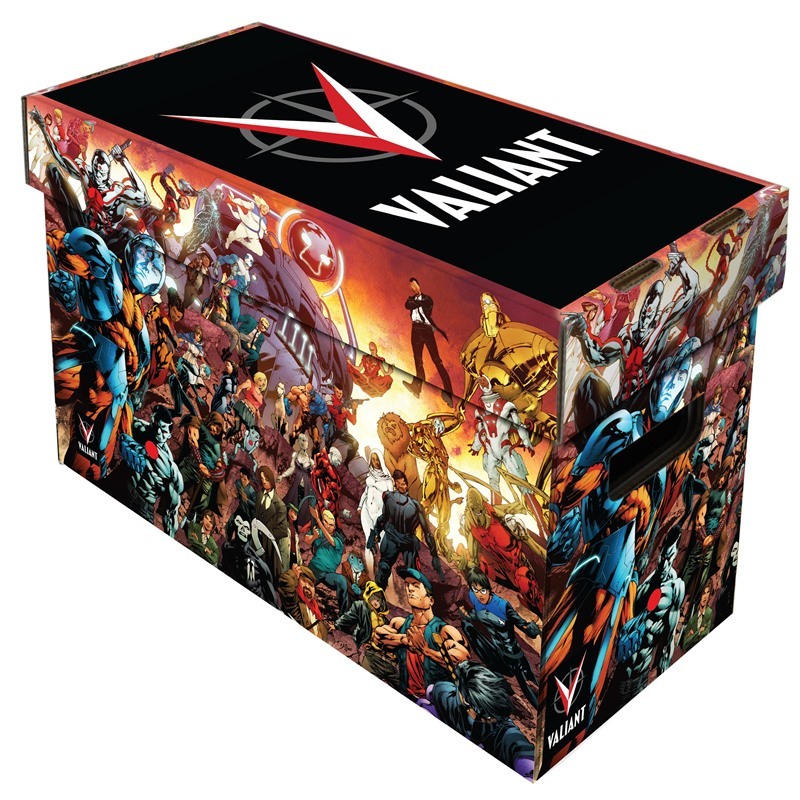 Includes superhero miniatures for the ultimate experience in Valiant-based gaming! Featuring artwork by artist Raul Allen. Available in S-XXL. Featuring artwork by artist Lewis LaRosa. Available in S-XXL. 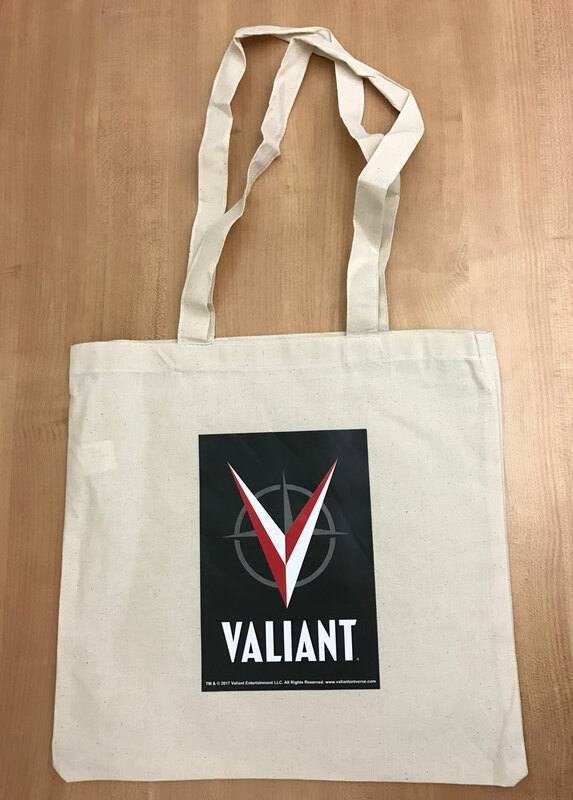 Featuring the logo for Valiant's upcoming, live-action, digital promotion. Available in S-XXL. 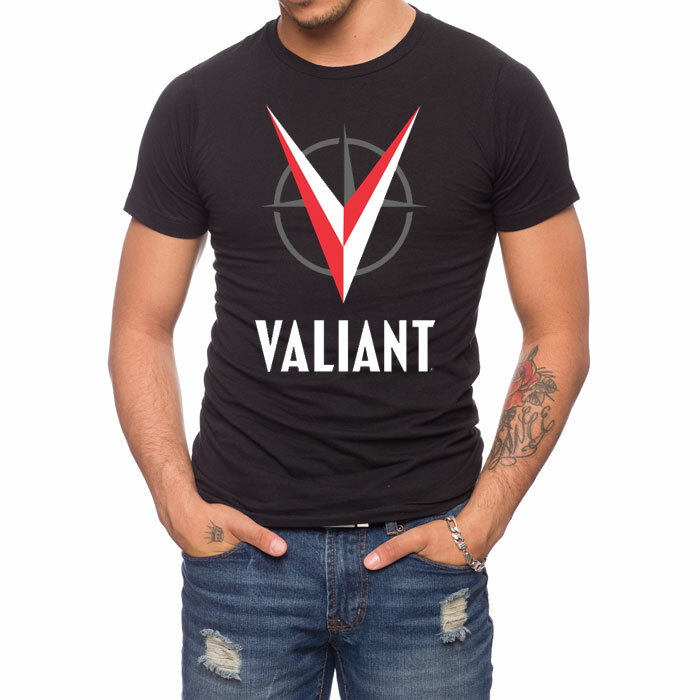 Featuring the iconic Valiant logo – designed by award-winning artist and designer Rian Hughes – in classic crimson. Available in S-XXL. 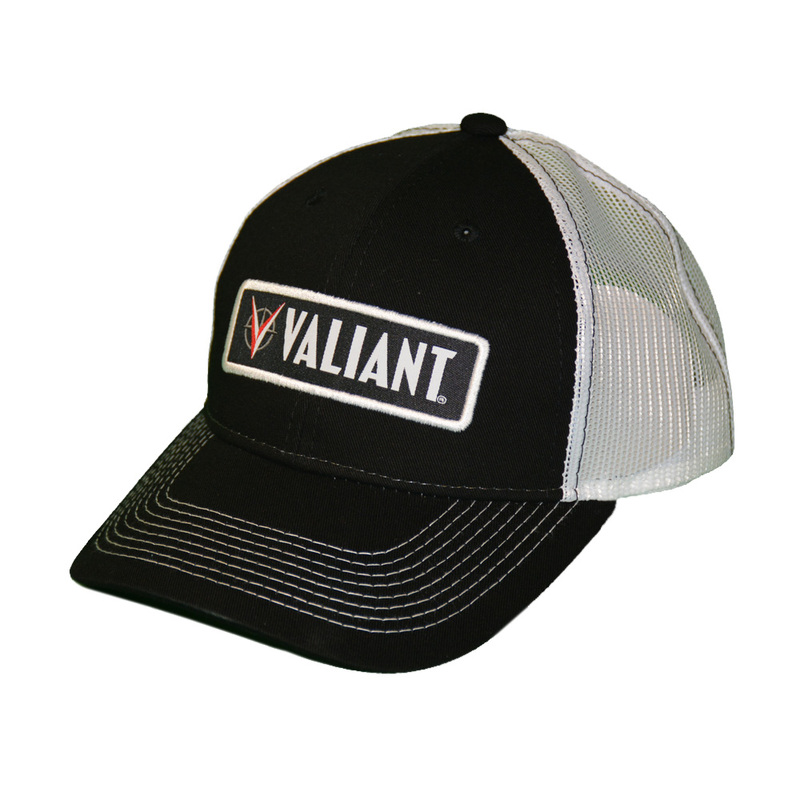 Represent Valiant everywhere you go with this durable mesh hat! 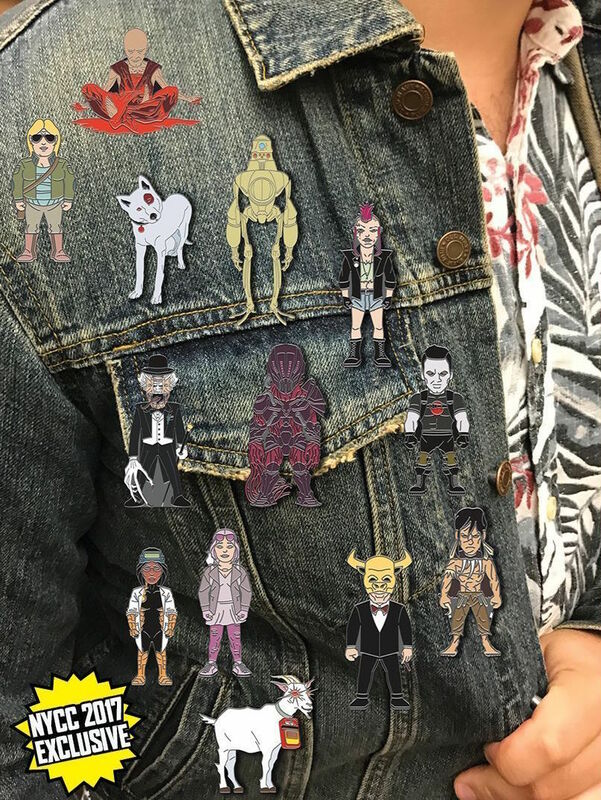 Made of a cotton and canvas blend, and perfectly sized to fit a Wednesday’s worth of comics, graphic novels, and more! Made 100% “Flexfiber” and featuring wraparound artwork by 2017 Eisner Award nominee Pere Perez (FAITH)! Are you headed to New York Comic Con 2017? Let us know in the comment section below. Also, Don’t forget to like, share and subscribe to all things Constant Collectible to keep up to date with all the news and reviews from a world of GEEK CULTURE.